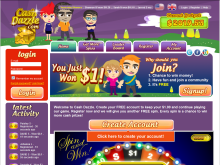 CashDazzle.com Reviews - Legit or Scam? Once you exhaust your supply of free tokens you will have to actually participate in the offers in order to get more tokens and keep yourself playing long enough to win the prizes. The main thing to keep in mind about sites like these is to be very careful about what offers and subscriptions you join. Make sure to read the terms and conditions of every offer that you are considering. The reason for this is that many are trial offers, meaning that after a certain period of time you will be billed a monthly charge for the continual use of the product, or be signed up to automatically receive more of it. While the company is not a scam, it’s very clear that by participating in their “free” games you are opening yourself up to a whole slew of advertisements. If you’re ok with that and believe it’s a fair trade for the chance to win cash prizes then feel free to play the games. Average Rating for " Cash Dazzle " is 1.94 out of 5 based on 18 reviews. they won't accept my unsubscribe!!! i earned 100000 and it is awesome! How long did it take for you to get your money? I can only hope to make that much. All I've been getting is basically coinage. How long did it take for you to get that much? After doing a certain amount of spins you're almost guaranteed to land on sorry every time. I didn't receive tokens for half the offers I completed. I sent them an email because the site wouldn't let me finish filling out my information and I never got a response back. Total scam. I did NOT sign up on this site but I am getting flooded with emails addressing me by name saying I DID sign up. What's up with that? Did someone steal my identity? they are a scam. I finally got to 20 and cashed out. after waiting 8 weeks for my check they sent me an email saying they wouldn't pay me because my activity was fraudulent. they said I used too many free spins. they were the spins I earned. they offered me a 50 restaurant.com gift certificate instead. after about 6 emails I never got my check. don't waste your time. Im glad I read the reviews. I currently have 7.40 and they can keep it! sounds like a major headache, which I don't have the time or energy for. They DO NOT send out checks. I cashed out in OCTOBER and it is now THE WEEK BEFORE CHRISTMAS... NO CHECK. hey i have a questin how do you get your money on there i signed up today and earned money but still dont know how to get it can you help me please?? ?